The T2U-200 rack shelf is a 2U high standard COTS ruggedized electronic rack shelf that comes as a complete assembly as shown and easy to install in most EIA racks. 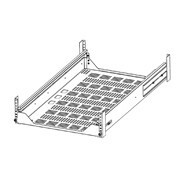 The COTS ruggedized shelf assembly includes 138 series slides which lock open, are quick disconnectable, and have adjustable brackets attached. As with most Jonathan aluminum slides, these slides are ruggedized and are suitable for applications with heavy shock and vibration. 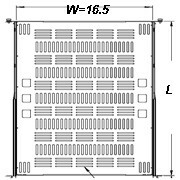 The ruggedized rack shelf assembly has front mounted panel fasteners to lock the tray closed, and has a load rating of 254lbs per shelf.